Lumen Learning has created an online resource to help proponents of open educational resources make the case for OER use on campus. The OER Champion Playbook offers a collection of ideas, tips and tools for building effective OER initiatives. The content spans five categories: Making the Case for OER; Measuring Impact with OER; Building Awareness & Enthusiasm; Supporting Faculty through Change; and Sustaining Change & Impact. Each category provides a variety of suggested activities, each with links to additional information, worksheets, examples and more. For instance, ideas within the "Making the Case for OER" section include creating an OER initiative website, developing a persuasive elevator pitch, organizing an OER summit, setting up an OER sandbox and engaging student leadership. In addition, a "Share Your Ideas" link allows users to submit their own additions or improvements to any section of the Playbook. "The Playbook is a living document," noted Julie Curtis, VP of strategy and communication for Lumen Learning, in a blog post. "We'll continue adding to it as we collaborate with, learn from, and support many and diverse champions for OER. We'll continue collecting and attributing wonderful resources we encounter along the path supporting OER adoption." 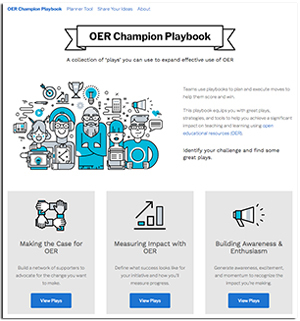 The OER Champion Playbook is freely available on the Lumen Learning site. A companion OER Champion Workbook, featuring a step-by-step guide to planning and executing an OER initiative, is available free with registration.